Stay a bit longer in un-comfortableness. This goes against the grain of what we are conditioned to do. 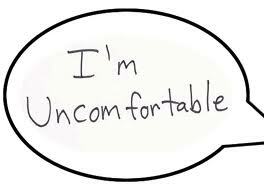 Usually when we become uncomfortable we want to run and get away from that which makes us feel that way. However, "Staying" is a great Teacher. Staying breeds compassion. To begin to see that what you are trying to get away from, is something that you have either done yourself or are currently doing and accepting that … seeing that and then acting from that ... are all Great Tools in beginning to know who you Are. This goes back to the writing the other day on "The Same" once one sees their own hypocrisy, they are a bit less judgmental (or not at all) … a bit more compassionate (or completely) … a bit more open to new ways of seeing and being in the world. You are not running towards or away from anything, you are just in the moment you are in, and you may have ideas or opinions about that moment, but you are willing to sit through them. You don't have to agree, you just have to sit.